Here I would like to present an ever-growing (hopefully) list of fun bookish links. There may be other blogs, image galleries or simple wish items. Enjoy! The website without which I would have no direction – Goodreads has provided me with hours of ideas in the last 5 years. I’ve found countless new books to add to my to-read list, I’ve been introduced to new amazing authors and I’ve been able to keep up with friends too! http://sfpl.org/index.php?pg=0100002801 – San Francisco Public Library has been a source of solitude, education, and peace for me since 1996 when I immigrated to San Francisco and landed in an apartment three blocks from one of its branches. To this day by some miracle I am never far from SFPL – I work three blocks away from this branch! Libraries of the world – If I could visit just one of these, I think I would die a little bit happier. My Romani Book Review Blog with Khetanes – I review books with Romani (Gypsy – but that’s not a proper term) themes. 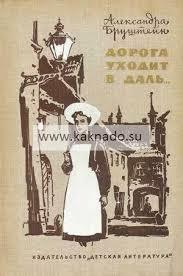 A bit about an author that changed my life – I read Alexandra Brushtein’s “Doroga Uhodit v Dal” when I was maybe 9 years old. I re-read that book at least ten times in the twenty years that followed. I consider her the single most influential author of my childhood because she both awakened my interest in history and sparked my Jewish pride. My copy of the book was rescued (loosely appropriate here) from the Catholic Cathedral of St. Florian in my hometown of Shargorod to which my father sold the book when we were immigrating. My copy looks just like below image! “Doroga Uhodit v Dal'” was one of my favorite books, as a child, and I still quote from it. Also, it was interesting to find out about your interest in Romani-themed literature and Romani issues. I don’t know whether I have Rom blood, but I do have quite a few Rom friends, and I’ve always had a passion for their music. There are photos here and there in some of my posts. Very nice to meet yay as well! I love being able to bring interesting things together. That book especially had set me on a path as a reader, it’s one of the many things I’m grateful for from my mother’s legacy. Thanks to you, I discovered that it has been translated into English. My husband speaks fluent Russian but he doesn’t read or write, so some books I actually read to him, but I don’t have a copy of this one. Has it been published then? Long time ago when I was young I had a dream of translating it myself actually! I made a mistake: it’s an article about her that has been translated, not the book itself. My bad. What a shame! Why don’t you translate it, really?